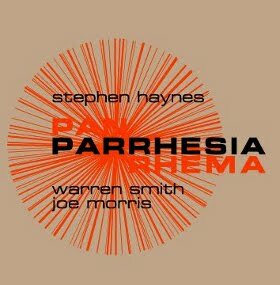 Trumpeter Stephen Haynes is joined by Warren Smith and Joe Morris on his new trio CD Parrhesia (Engine, 2010). In this interview, Haynes talks about “relational” arranging; how the album captured a special day in the recording studio; and why he tries to focus on making music in his local area. Learn more at stephenhaynes.blogspot.com. I thoroughly enjoyed our conversation (the interview) Jason. You asked some thoughful questions and I loved what you drew out from me and weaved into the podcast. I’m having a ball sharing this, and have asked the Follow the Sound Festival folks to link to your site (they have). Looking forward to more shared conversations in the future. Thanks, Stephen. It was great to talk with you. You got Stephen on board for Bill Dixon’s birthday. Nice. He’s doing all the heavy lifting for the Dixon legacy in addition to his own distinctions. All thanks to you, brother.